While the exposure to crude oil for 16-18 hours a day nudged me over the edge into full-blown autoimmune disease, I will always be grateful for the opportunity I had to work with a variety of species, including my favorite: pelicans. I worked with brown pelicans at the oil spills in Southern California, and with white pelicans on a feeding ecology project run by Dan Anderson, chairman of the Wildlife and Fisheries Department at UC Davis, on the pelicans up in Tule Lake, CA. This is me back in May 1990, after working on the spills but before I started to get sick. 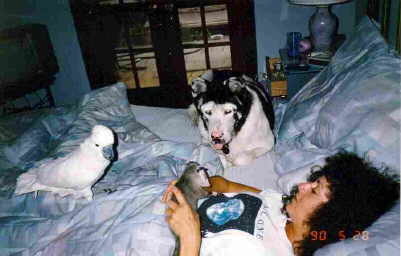 Sharing a lazy Sunday morning in bed is Stevie, the Moluccan cocktoo, Koji, the akita with Vogt-Koyanagi-Harada (which causes, among other things, uveitis and vitiligo) and Mikey, an opossum who was born without eyes, found wandering a golf course at about 9 months of age. I started doing inclass lectures on vertebrate taxonomy for a wildlife educator whom I met working on the oil spills. 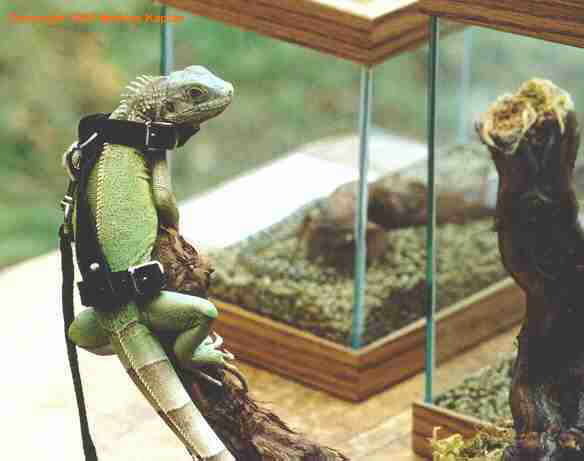 That was where I met Dexter, the iguana I ended up fostering during the slow season, and who was responsible for my deciding to get an iguana for myself, the iguana many of you know as Wally. I got Wally in 1991, and fairly soon thereafter, started including him in the educational programs I did in schools, for civic groups, parks departments, herp expos, etc. Above: This is Wally in the Spring of 1992 at an open-house at a California Native Plant exhibition and garden. It was our first time working outside, so I used a cat harness (cut down to his size) attached to a length of clothesline, which in turn was tied to the branch he's resting on. This was just to give me an extra second or two in case he decided to take off or was scared into doing so. (This works okay for hatchlings but not for juveniles or adults! It is no substitute for paying attention to everything going on around you, however, and is not a taming device.) As it turns out, he was so entranced by all the people and other herps we brought, that he stayed on the table, walking around and checking out all the (mostly) California native species of herps we brought with us and enjoying the attention. 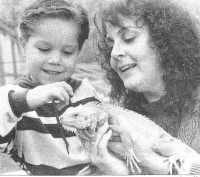 Above: This photo, appearing in the April 29, 1993 Los Angeles Times, was taken to promote an upcoming herp expo at which I was going to be doing an educational exhibit the following weekend in Costa Mesa, CA. Here, Wally is not quite 18 months old. For information on my herp-related background, please see my Brief Autobiography. For information on CFS/FM/MCS, please see the the Chronic Neuroimmune Diseases section of my site. For information on Lyme disease and related tickborne coinfections, please see the Lyme section of my site. For information of a more personal nature, see Melissa-Kaplan.com.